Tests began in the month of May and will continue for several months. Tuesday 3rd October 2017, the aero-engine maker Safran is celebrating the success of the first ground tests of the Open Rotor demonstrator engine on its Istres site. 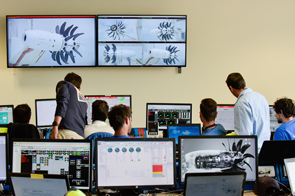 Within air base 125, the tests that began in May will continue for a number of months on the brand new open-air test rig belonging to its subsidiary Safran Aircraft Engines. This 15 million euro facility is unique in Europe. Rivaling the best facilities worldwide, its aim is to develop new-generation engines, which are more fuel-efficient and, therefore, more environmentally friendly. After 16 months work, the Safran Group’s 2nd open-air test rig on its Istres site has recently become operational. The 80,000m2 facility, designed to be able to test large and complex aircraft engines under near-actual conditions is unique in Europe. 45 operators are working within a 660 m2 control systems building, closely monitoring 1,200 measurement lines via a data acquisition system. It has benefited from investment of 15 million euros within the framework of the European Clean Sky program – an ambitious environmental protection program. The series of tests for the new Open Rotor demonstrator, the result of 10 years development work, will last until the end of 2017. The Open Rotor tests are intended to experiment a new propulsion system, which is tailored to the future needs of aircraft manufacturers in terms of rationalizing costs and environmental targets. With its turbine driving two banks of counter-rotating, unshrouded fans, its conventional gas generator and a system in the tail of the fuselage, the Open Rotor represents a key research area, which represents a break from the architecture of current engines. The incorporation of innovative technologies, such as the use of 3D composite materials, including woven carbon for the blades, offers amazing opportunities for improving industrial performance: robustness, production time savings and an overall reduction in the weight of aircraft, thereby contributing to a significant decrease in fuel consumption. Creating the engine of the future, which is able to respond to environmental challenges, is the goal that Safran is aiming to achieve by 2030. Bolstered by close cooperation with more than 50 partners, the Open Rotor has benefited from 65 million euros in European Commission funding over a period of eight years. Within the framework of Clean Sky, one of the largest European aeronautical research programs, 600 entities from the public and private sectors have shared their expertise with the aim of decreasing the emission of pollutants into the atmosphere (Co2 and Nox) and reducing noise. Extended until 2020, Clean Sky 2 will enable Safran to continue its work. A commitment supported by the ACARE (Advisory Council for Aviation Research and Innovation in Europe), which is aiming for 50% less CO2, 80% less Nox and 50% less noise pollution by 2020. 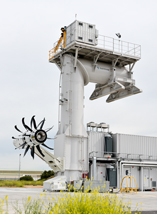 Safran needed to choose a location for the Open Rotor test and investment in its test rig. The diverse range of major ongoing industrial and structural projects within the Aix-Marseille Provence metropolis was a decisive factor. The significant technical expertise being developed there enabled the needs relating to construction and the success of this project to be met, which resulted in the creation of 45 direct jobs on the Istres site. The Aix-Marseille Provence metropolis is thereby contributing to the growth of this international group, a first-tier supplier of systems and equipment for the aeronautics, space and defense industries. Conversely, this equipment, which lies at the heart of the Safran Group’s innovation strategy, now offers the region the opportunity to penetrate the civil aviation market of the future. Safran has also already developed partnerships with local businesses, schools and structural projects, such as the Henri-Fabre project.